And it probably won’t matter. 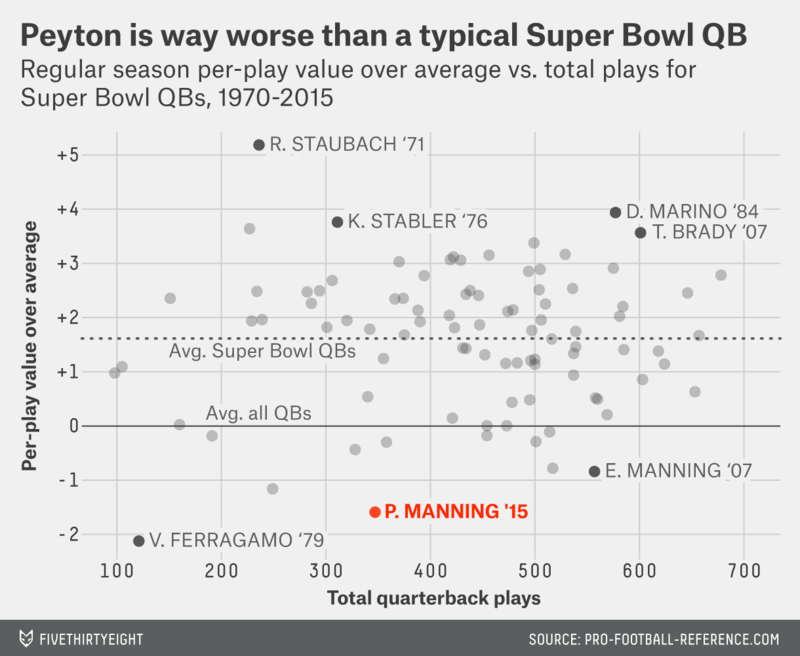 Peyton Manning’s 2015 was bad, but the Broncos made the Super Bowl anyway. Peyton Manning, The Sheriff, is back in the Super Bowl saddle. Good for him; we’ve written many paeans to Manning over the years, for the simple reason that he’s the greatest statistical quarterback of all time. But let’s face it: 2015 was also far — faaaaaar — from Manning’s best season, and in the context of a Super Bowl appearance, Manning’s standard of play pales even in comparison to “game managers” like Trent Dilfer. In a lot of ways, Peyton’s 2015 was worst regular-season performance ever by a QB who would eventually start the Super Bowl. During the regular season, Denver had the NFL’s eighth-worst passing offense according to Football Outsiders’ defense-adjusted value over average, with a mark one full standard deviation worse than average. That’s really bad by Super Bowl standards: If we index the Broncos’ DVOA relative to the league, the only post-merger Super Bowl team to throw the ball less effectively were the Vince Ferragamo-led 1979 Los Angeles Rams. Now, Manning was injured during the regular season and missed six games, so you might think others share in the blame over the Broncos’ lousy aerial attack. But you can’t pin this on Brock Osweiler — he was mediocre in Manning’s stead, not outright horrible. Manning, on the other hand, was the league’s worst QB (on a per-drop-back basis) according to adjusted net yards per attempt (ANY/A), and its second-worst according to DVOA. He ranked among the bottom 15 percent of NFL passers in not just conventional categories such as touchdown and interception rate, but also fancier numbers like the percentage of his throws that were on-target.1 Plain and simple, he stank. Manning, by contrast, plays in a pass-crazed era and threw the ball about as often per game as his peers, despite his horrible passing efficiency rates. The result, according to Football Perspective founder Chase Stuart’s method of judging QB value versus league average (which considers both passing and rushing value) was by far the worst regular season by a Super Bowl starter since the merger. With a few notable exceptions, one being Brother Eli on the 2007 Giants, even the dumpier quarterbacks who get to the Super Bowl tend to play at about a league-average level. But Manning has blazed a new trail for ineffective passers with eyes on the Super Bowl, so long as they play in front of a superlative defense and cobble together a few decent playoff starts. There’s a reason the 2015 Broncos’ most similar team was the 2009 New York Jets. Funny thing, however: Manning playing poorly doesn’t seem to matter very much for Denver’s chances of winning the game. Based on regular-season value over average, Cam Newton and the Panthers have a huge advantage in the passing game over the Broncos — the sixth-biggest in any Super Bowl since the merger, in fact2 — but that hasn’t mattered much in past Super Bowls. Whether you look at total or per-attempt measures of value, there’s essentially zero correlation between the disparity in regular-season QB performance for the Super Bowl opponents and the eventual point margin of the game itself. This makes sense, as the equilibrium of a successful team will account for poor play from any given position (even QB) if the rest of the team is strong enough. And given the importance of quarterbacks to modern NFL play, the Broncos’ compensation for Manning’s play is just about the most impressive thing we’ve seen out of a unit leading up to a Super Bowl. In the estimation of ESPN’s Stats & Information group. The biggest passing mismatch was the aforementioned 2007 Eli against the record-setting Tom Brady.